WASHINGTON CITY – While the issue of the slow-moving slide on a hillside portion of Telegraph Street appears to have been resolved, the road will once again be temporarily closed for utility and general roadwork. Access to Telegraph Street between Washington Parkway and state Route 9 will be closed from Nov. 29 to Dec. 2, according to a statement from Washington City officials Wednesday. The work will take place specifically between Washington and Highland parkways where damage has been caused by a slow-moving landslide. That issue appears to have been resolved with the construction of an earthen buttress. No major movement has been detected since the buttress was completed, Mike Shaw, Washington City’s public works director, said Monday. As one part of an overall estimated $1.5 million fix and repair bill, city officials hope the buttress will put an end to the slide that has been occurring along a 700-foot stretch of the hillside. The gradual drop in the hillside really hadn’t been a major issue until late 2014, officials said, when it began to pick up speed. 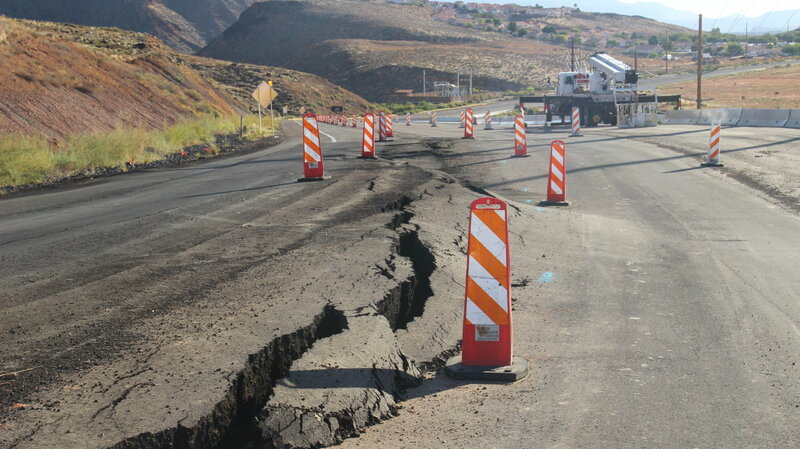 Visible cracks appeared in the roadway in late summer, becoming more pronounced as time passed. The road has since been temporarily resurfaced and will eventually receive a more permanent surface as roadwork concludes. What’s the over / under on this thing sliding again when the rains start? Might want to check your facts before posting an article trolling for views. Telegraph road is, in fact, NOT CLOSED – nor has it been all day. I have driven over it 4 times now, in the last 12 hours. Using an old picture of when it was closed, rather than fact finding – you should be ashamed. Lol! You mean to tell me that StG News does not have a time machine? You better get somebody on that!